Business phone systems support a network of land or internet-based phone lines for inbound and outbound calling. These systems come in a variety of forms but the most common are VoIP-related phone solutions. Business phone systems have many features and price points, providing options for organizations of all sizes, from single-member businesses to call centers. Nextiva (Best Overall) Businesses wanting the best balance of features, price, and customer support. RingCentral Growing companies that want a provider with plans and features that can scale over time. Vonage Businesses and sales teams wanting online communication and collaboration tools. Grasshopper Solopreneurs and business owners needing a business phone number on their personal device. Phone.com Organizations with customers or clients outside the U.S. that need an international calling plan. There are a variety of business phone systems on the market, allowing you to find the right solution that meets the needs of your business and budget. 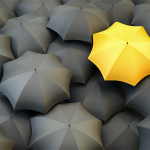 Here’s a closer look at some of the leading providers and what makes them stand out. Nextiva ranks as our best small business phone system provider with service plan prices ranging from $19.95 to $27.95 per user, per month. It features unlimited domestic calling, SMS messaging, voicemail transcription, and a conference bridge. Nextiva receives high marks from customers who say it’s easy to use and backed by a responsive customer support team. Nextiva is a great choice for businesses that want a turnkey business phone system at an affordable price. Check them out today for more information. RingCentral is a leading small business phone system solution with four price plans ranging from $29.99 to $59.99 per user, per month. Features include unlimited phone calls, mobile apps, and unlimited audio and video meeting. They also offer great volume discounts for larger organizations. RingCentral receives great feedback from customers for its easy to use interface and robust set of features. RingCentral is the right solution for companies wanting a business phone system that can scale as their business grows. Visit their site today for a complete list of offerings. Vonage is a business phone system with three service levels that cost from $19.99 to $39.99 per user, per month. Plans include unlimited calling, video conferencing, chat and file sharing. Vonage customers give the service high marks for its call quality and flexible calling plans. Vonage is right for organizations and sales teams that need online collaboration tools to help them maximize productivity. Head to their website for more information. Grasshopper customers give the service good reviews, with an emphasis on how easy the system is to set up and use. Grasshopper is the best fit for solopreneurs and small businesses wanting a business phone number on their personal mobile device or landline. Contact them today for a complete list of features and functionality. Phone.com is a business phone system provider that offers three service plans with prices ranging from $29.99 per month to $59.99 per month. Features include unlimited calling to select countries outside the U.S., faxing, and text messaging. Phone.com receive high marks from customers for its affordability and range of optional add-ons allowing users to customize their plans. Phone.com is best for business owners that make and receive a lot of international calls and don’t want to worry about cost overages. Navigate here to learn more. Phone system costs range from $12 to $90 per user, per month. Low-cost plans with basic features like free phone numbers and unlimited calling are a good fit for solopreneurs and smaller teams. Higher-priced plans with features like CRM integration, call analytics, and multi-level auto-attendants are a better fit for call centers and larger businesses. *Average monthly prices shown are based on annual payments. A business phone service doesn’t have to be expensive in order to be reliable. VoIP phone systems allow you to save the monthly expense of maintaining a separate utility in order to make and receive phone calls. In addition, depending on the service you select, do not require you to purchase additional equipment. Business phone system provider OnSIP offers a free service and is a good option for small businesses on a tight budget. OnSIP features a free app for making internet-based calls on desktop and mobile devices for free voice and video calling. Additional features include support for up to 100 users with unlimited extensions, and Slack and Zendesk integrations. Business phone systems are land or internet-based tools used to communicate internally as well as with external customers and prospects. They include not only the telephone hardware necessary to communicate with callers but also any additional equipment like power supplies, headsets, and routers to connect internet phone systems online. Business phone systems are packed with features to help organizations manage communications with callers, but it’s important to remember that phones with newer technology tend to offer more features. However, while traditional landlines may not offer the same number of options as the best VoIP or softphones offer benefiting small businesses, they still pull their weight with call management tools like call waiting, hold, and call transfer. Call management tools allow agents to place callers on hold, forward calls to other phones, extensions, or voicemail boxes, park calls, block inbound calls by phone number, and screen incoming calls and is a critical feature for call center phone systems. Some providers also allow customers to record personalized voicemail greetings for recognized callers and include voicemail-to-email transcription and voicemail search with their service. Many business phone system providers include one free local phone number with new accounts and some also offer a toll-free phone number. Most providers include free extension numbers with their pricing plans for business owners to assign to individual employees, but additional phone numbers are typically available for purchase if desired. Most business phone system providers include unlimited domestic calling with their plans and per-minute international calling rates. Some providers feature unlimited international calling to groups of countries or offer buckets of prepaid minutes customers can purchase in advance for a lower pay-as-you-use calling rate. Some phone systems integrate with business tools like support ticket systems, chat, and email to keep teams connected and working efficiently. Some systems also support integration with CRM applications commonly used by business organizations like Freshsales, Pipedrive, and Salesforce so that employees can document every interaction will callers. Auto-attendants automatically greet and route callers to pre-specified extensions, phones, voicemail boxes, or offices. Some auto-attendants can also route calls to multiple locations and can be used on external phone numbers, so mobile or personal phones function the same as the user’s desk phone. 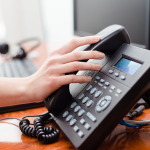 Business phone systems can range from a couple of desktop telephones in a small office to a complex array of phone lines connecting multiple offices across the country. Companies have a variety of options to choose from when selecting a system that includes the business phone system features they need. Voice over internet Protocol (VoIP) technology transmits your voice over the internet instead of over traditional copper wire used in landline phone systems. VoIP business phone systems offer companies a wider range of features than landlines, like advanced call management tools, CRM integration, and unlimited calling. This a good choice for sales and support teams wanting phone system tools that support the customer service experience. Call center business phone systems improve the customer experience with features like automatic call distributors for routing inbound calls and interactive voice response systems that automate many call center tasks. Some systems also include call monitoring, analytics, and reporting for organizations that want to monitor and improve call center performance. Private branch exchange (PBX) business phone systems use a piece of hardware installed on location to receive and route incoming calls. They include call management tools and other features that help companies professionally manage their business communication in-house. However, localized PBX systems can be expensive to set up and maintain, so PBX systems hosted by VoIP business phone service providers are often a more affordable option. Landline business phone systems transmit call data via your local or regional phone company’s expensive standard copper wiring. Though not as feature-rich as VoIP or softphone technology, landline business phone systems have excellent sound quality and almost 100% uptime, making it the best choice for businesses like emergency tech support that must be available by phone 24/7. Unless you’re relying exclusively on softphone apps to communicate with callers, telephone hardware is an essential part of a business phone system. Let’s take a look at some of the equipment you may want to invest in for your office when setting up a business phone system. Desktop phones cost anywhere from $30 for no-frills handsets to $800 for a feature-rich model. Basic desktop phones have features like call hold and forwarding while advanced desktop phones offer video calling, call recording, and multi-line support. Desktop phones are a good choice for organizations that want to assign phones to desks or offices rather than employees. Conference phone pricing ranges from $250 for basic models to $800 for higher-end phones. No-frills phones include 360-degree microphones and programmable ringtones while conference phones with a higher price tag offer options like touchscreen interface and customizable apps. Conference phones are a smart choice for distributed teams and organizations with employees who travel. Call center phones prices start at around $50 for budget phones and climb as high as $600 for phones loaded with all the bells and whistles. Basic phone features include call logs and dedicated hold, speakerphone, and voicemail buttons while more expensive phones offer options like built-in WiFI and Bluetooth, video-conferencing, and HDMI monitor ports. Call center phones are designed to help callers have the best possible customer experience. When you set up your account with your new provider, one of the first decisions you’ll make is about your business phone number. If you already have an established number, chances are you won’t want to change it and risk losing customers. Fortunately, most providers will port your number to their service for free. Be aware that the process can take a few days or a few weeks, depending on how long it takes your current carrier to release your number. If you don’t have a business phone number or want to get an additional line with your new account, this step in the process is a great time to consider a vanity phone number. Customized numbers like 1-800-FLOWERS are easy for customers to remember and help your business stand out from competitors. Most business phone system providers include individual voicemail boxes for each user on the account. That may be sufficient for missed calls during lunch hours or while agents are taking other calls, but business owners may want to consider an answering service to make sure customer calls are answered around the clock, even when no one is in the office. Some answering services provide live receptionists to answer phone calls 24/7 year-round while others offer live receptionist service during standard business hours only with off-hour availability for an additional charge. Answering services do more than take messages; some also offer custom scripting, customer troubleshooting, and provide personalized live greetings to callers. Some business phone system providers include conference calling in their price plans, but the number of meetings or participants may be limited. Companies that hold a lot of conference calls or online team meetings may want to consider a separate conference call service to complement their business phone system. Conference calling features include security tools like PIN and dedicated phone numbers and call controls for managing meetings and participants. Some services also offer call recording and storage, mobile apps, and HD video support. Business phone systems are a crucial part of your organization’s internal and external communication strategy. A good phone solution includes features that support both employees and customers, like user extensions, voicemail, an auto-attendant, and CRM integrations. It should also be affordable, easy to use, and backed by reliable customer support. Price: We evaluated the price of each provider based on the features it offered and the number of users it accommodated. Features: We assessed the number and types of features each business phone system offered overall and within each tier, where applicable. Ease of Use: We evaluated how easy each phone system is to set up and use. Customer Support: We assessed the types of customer support each provider offered along with its online accessibility and live support hours of availability. We recommend Nextiva as the best overall business phone provider for small businesses because they offer the best combination of features and industry-leading customer support, at an affordable price. Nextiva’s features advanced call routing, unlimited free domestic calling, voicemail to email and text, online faxing, and more. Often times, the best way to choose the right business phone system for you is to check existing customer reviews on top VoIP providers. This can help you get a sense of providers’ features, functionality, ease of use, customer service, and more before you buy. You should read our reviews of the top VoIP business phone providers for information on price, features, comparability, as well as other considerations. Once you’ve selected your businesses phone service and hardware, you may have a few questions about implementing the service in your office or about the business phone industry itself. Here are the answers to some of the most common questions readers ask. 1. How Many Phones Can My Bandwidth Support? If you plan to use a VoIP-based business phone system, be sure to test the speed of your internet connection to learn how many phone lines the system should be able to support and anticipate call quality. 2. What Is the Current State of the Business Phone System Industry? Thanks to wireless business phone hardware, workers are no longer stuck at their desks by corded telephones that restrict their movement. Softphone apps allow users to make and receive calls on their computers and mobile devices and give business owners even more freedom to leave the office without worrying about missing important client calls. 3. What Should Look for in a Business Phone System Provider? Business owners should prioritize what components of a business phone system are most important to their overall company goals. Some may value price over a range of features while others may be comfortable with limited access to customer support. We offer a number of reviews on top small business VoIP providers to assist with your decision making. After all the research and testing is done, it’s time to choose which business phone systems will help contribute to the success of your business. From the system you select to the hardware you buy, it’s important that the entire ecosystem work together to deliver a seamless customer experience to your callers. Businesses ready to invest in an affordable VoIP business phone system with a set of features that are comprehensive enough to meet the needs of most small businesses should check out Nextiva. Watch a demo or call a sales agent to set up an account today. Visit Nextiva’s website today for details.